Bosnia and Herzegovina is the second most miserable place in the world, at least in terms of holding a job and keeping the rising cost of goods in check, according to Bloomberg. 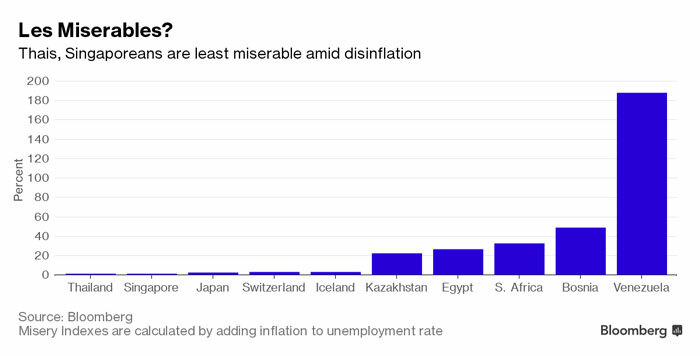 The Misery Index, computed by adding inflation to the unemployment rate, gives Bosnia a score of 48.97 percent, which is the second worst of all 74 economies surveyed by Bloomberg. The only worse country is Venezuela as plunging oil revenues have led to chronic shortage of food and medicine, and inflation running at 181 percent. With an index of 188.2 percent, the South American country is easily the “world’s most miserable” place. It is followed by Bosnia at 48.97 percent and South Africa with 32.90 percent. Thailand is the happiest place in the world with a score of 1.11 percent, which is the best – or least miserable. Thailand’s unemployment rate was around one percent at the end of June, while its consumer price index rose 0.1 percent year-on-year in July versus a 0.4 percent increase in June. Singapore and Japan are close runner ups, with 1.40 percent and 2.70 percent, respectively. The U.K. ranks the 17th least miserable country while the U.S. takes 21st place. China follows closely in 23rd spot.